Recently, June 2016. I was invited to join a friend and her family at a lake in NC. I arrived on Saturday morning, but all cabins were booked for the night. The group of us enjoyed the day at the lake and playing card games at one of the houses. I decided to check on any cancellations for a cabin. I went over to the office and luckily something just happened to be available. Cabin 4. Perfect, my friend and her family were in #3. We needed some things from the grocery store, so 3 of us went. I was dropped off at my cabin to put my breakfast away and told them I would walk back to the house for dinner. I went in, freshened up and took pictures, inside and out. They weren't the best and I was going to erase and try in the morning. Had dinner enjoyed the evening but my friend and I stayed outside at my picnic table just talking until midnight. We went into our own cabin for the night. All alone, trying to work the TV and get showered for bed. All seemed well until... I thought I had pulled the bathroom door a little shut but not all the way. As I was showering, I opened the curtain to reach for my toothbrush and toothpaste. The door was wide opened and it caught me off guard, thinking it pulled a little shut. Ok weird, can't remember. After the shower I went into the bedroom to dress, but it had a strange feeling which wasn't there before. After dressing I went back to the TV area. On the blue carpet leading from the door to where I stood in front of the TV were little faded white round circles. About the size of a quarter. I tried to wipe them with my foot but nothing. So I was ready to sleep but had to force myself to go back in there to bed. I could see the TV from the bedroom. But something was so creepy in that room, I lasted all of a minute. I grabbed the sheet and pillows and headed to the couch. I put towels on the couch because it looked grungy. Finally I fell asleep for an hour or so. I woke up just after 230am. I felt as if something was standing there and I knew to cover my face. I was constantly waking up ever hour. Finally, 720am came and I was so relieved that creepy night was over. I told my friend about it and how I wanted so badly to text her to come and stay with me. I went home that Sunday afternoon, and was sad to have gone so early. I never retook the pictures. I was browsing through them that evening. I then noticed something I didn't see before. In the picture facing the bedroom, the bathroom door is ajar and there is a hand or arm of something pushing it open. I now know it was there the whole time and I wasn't alone that night and it wasn't my imagination. If you enlarge the picture, there is what looks like a skeletal face. Strange things have happened to me all of my life. It wasn't until recently after a car wreck, that 3 things have come into my vision. Lots to share, a lot to type. I slept with my lights on for two nights after seeing the picture. The following comments are submitted by users of this site and are not official positions by yourghoststories.com. Please read our guidelines and the previous posts before posting. The author, purpletrees, has the following expectation about your feedback: I will participate in the discussion and I need help with what I have experienced. thanks for all the info and comments. Something was pushing the bathroom door for sure, the feelings and white spots can't be ignored by myself. But the lately info on this my friend from cabin 3 who senses these types of things also, told me the two times she used my bathroom that night, she was scared and couldn't go fast enough to get out of there. She should have told me and I would have left. This is only 1 of many many experiences over my life time. I will post the soon. Thanks again. When I read your initial post some months ago, I reserved judgement until the photographs were available for review. Thank you for posting them. My overall impression of your account is pretty solid, in that I believe you were a witness to these unsettling events. Your clarification for shelby sounded like the owner was feeding you a line of B.S., "when I asked if there was an available cabin, the owner said no. As I was about to turn away, he said how many. Just me. Oh I have cabin 4 just cancelled earlier." Who operates a business and FORGETS that today's income will be lower than expected? 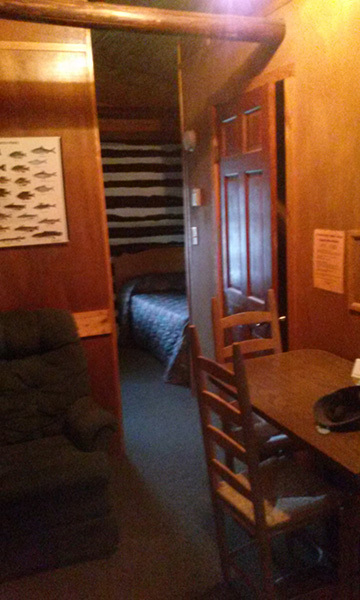 There's a lot to do to maintain camp cabins, motels, etc., and those tasks cost money... This seemed even more dodgy when he wanted to know "how many?" 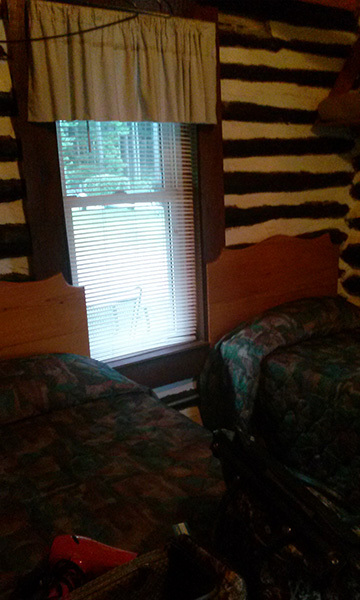 There are clearly two beds in your second shot of cabin #4. Now, having inspected the first photo you've provided, I'm going to get semi-technical. There is a light source providing some glare both on the wall and on the beam in front of the camera, and upon the wall to the right of the camera. Between these, there is a lens flare at the top of the image, as the same light source has caught your camera lens. This means your camera is not the light source, but there is a light fixture above and to the right of the center of the picture. As this light is casting shadows, too, I'd like to point out that the gap at the top of the door would create a space which would permit light to pass through it at a diminishing angle (due to the door hinge). As I inspected the brighter area behind the door, it appeared to me to be the shadow of the door lintel and the shadow of the door being cast onto a wall inside the closet, just as the angle of the beam's shadow is cast upon the wall running at right angles to the bathroom wall upon which the light is cast on the other side of the door. While I still believe that there was something bizarre & paranormal about your night there, I'm afraid I don't believe that you've photographed anything more than shadows on a wall. I actually do see something in the doorway. Like an arm reaching or something. It's white but a cloudy white! Think the most creepy and disturbing aspect of your experience would have to be the faux-zebra skin wallpaper in the bedroom! Maybe it was THAT aspect of the cabin that was creeping into your subconsciousness😆! If I look at your bathroom door photo, in the context of "this is just a photo of a cabin" and not in the context of "there was a malevolent entity in there", then I can't say that the photo shows anything conclusive other than a blurry shape in there which, let's be honest, could be ANYTHING. Being devils advocate here; I wonder if your imagination ran a bit wild? You said all seemed well until the bathroom door was open, but you weren't sure if you left it open. It could have just swung open by itself? In my experience, I walk into a room / house and if the atmosphere OFF, it's generally OFF right from the outset. And that feeling doesn't leave. Of course, we can be surprised by awful things manifesting near us at any point out of the blue, bless their rotten hearts. Perhaps by this point your imagination is starting to do cartwheels and by now you have worked yourself into a state of mind that you are convinced there is something sinister lurking in your cabin with you. I can kind of make out something in the doorway that doesn't appear like it 'should' be there. Blerugh. Maybe 'something' was peering at you from the bathroom. Almost as if to size you up when you arrived. I don't know, there's something mighty creepy about the night you describe. All details seem to point to yuck. About the white circles, I had the same thoughts as Shelbylore, a peg leg or cane. Really glad you got out of there. 😭 I couldn't make out the skeletal face, is that in the other picture? Very interesting story... Please write more! And by the way, you should have texted or called your friend! Thank you Redwolf. I'll check that profile page. I can't believe I did it either. If I had noticed things in the pictures. I wouldn't have. I'm sorry that I spelled your name wrong and didn't comment on your story. It sounded like a serene area. BUT as I read further the area got creepier. Nightmarishly creepier. I don't know how you stayed in the cabin for the night. I hope that you find the information you are looking for and don't have any more creepy experiences. You can get a members e-mail from their profile page if that helps. There is a lake on Long Island that I have to do some research on so I can post a story about it. It is no ordinary lake, there is/was something supernatural about it. I just posted the photos on Paranormal Ghost Study through facebook. I still have them, I just wish these would get posted. Great information though. Oh...so interesting! I had to check back because this one seemed so weird. I'll second the 'something coming from the lake' theory, not everyone is probably thrilled to be at the bottom of a lake, human or otherwise. And the list of lake resorts and cabins where murders/bad stuff happened...wow. I'm sure the photo was deleted so you wouldn't dwell in its negativity or something along those lines. Omgosh. Thank you for all the research. Great information. I just resent the request to have the photos posted. I would love to get your opinion on these. Ok, I think I've figured out the lake and based on the construction and renovation date for the place you stayed, I think I've found that too. But I'll be hog tied if I could find one sinister thing that happened there - that absolutely does not mean that nothing ever happened, just that it's not going to be easy digging it up. And there are two very good reasons why it's going to be tough - 1. This is an area dependent on tourist dollars, bad press is obliterated 2. This is a man made lake meaning that water now covers land on which all kinds of history took place - shining too bright a light in the vibrant history of the area could lead to criticism of the companies that made the lake. Anyway - a very interesting case! Hi AugustaM. This past Saturday night I showed the photos to a medium. From his feelings he seems to think its a spirit who is tired of sharing his home with others. He said the best thing to do is delete the pictures. Thank you for all the research you have done on this. The mentioned lakes are not the one I was a part of. However, this small resort was been around since the 1960s and the new owners (1996) renovated all the cabins. Something happened on this site, no doubt and I will check into the history of the area. This resort is shared with a part of Virginia as well. I know I focused on a murder in my search and certainly, that isn't the only option but I get the feeling that whatever was in that cabin probably wasn't the remnant of a happy occasion. I'd recommend expanding the search by doing a quick search of the history of the area to see what sort of things happened there from battles to Native American uprisings to tragically failed homesteads to epidemics... If you get the chance to do so and find anything, p,ease share if you feel comfortable doing so! I doubt Cabin 4 had a cancelation, they probably walked in and walked right back out. No thanks! Or ran out in the middle of the night. Hey, it didn't follow you home so hurrah for that. actually when I asked if there was an available cabin, the owner said no. As I was about to turn away, he said how many. Just me. Oh I have cabin 4 just cancelled earlier. Then next morning I stopped in to see if I could have a late checkout, he asked how did you sleep? Smiling. I said not very good, the refrigerator was very noisy. I think they know something and its funny to them. But it scared me. I could feel a presence in the bedroom and beside that couch. The whole experience was strange. Hopefully the pictures post soon. There is a face above the window in the bedroom and the arm pushing the bathroom door opened. But it never fully opened while I was the taking pictures. So I read these usually over coffee in the day, but this one was still bothering me when I went to bed. Pegged legged skeleton snooping around bathrooms and bedrooms - yikes! I don't think owners, managers, employees are required to tell of deaths on their business property, unless the person questioning is purchasing the property. Even then complete disclosure is still not required in every state. If something awful happened at my business, no way I'd be running around talking about spooks. I'd go broke! If Cabin 4 is available ALL THE TIME, it's a little suspicious. I'm sure they know something but can't say what. Hopefully that doesn't happen again! I will try to load the pictures from my phone. I called the resort and talked with the owner and also did some online research but nothing came up. The owner laughed during our conversation. Could you post the picture? Pleeeaaase?! Checking the history of the place could shed some light over who was the owner of that arm. © The ghost story The Cabin is copyrighted to purpletrees. Edited by yourghoststories.com.